Here are some answers to questions you may have about Keep It for Mac. You can also find comprehensive help files in the application by choosing Help > Keep It Help from the main menu. For questions about Keep It for iPad and iPhone, see the Keep It for iPad and iPhone Support page. For questions about sales and registration codes, see the General FAQ. How can I buy Keep It for Mac? Is there a combo subscription for Keep It for Mac, iPad and iPhone? I've purchased Keep It from the Mac App Store, but it's saying I haven't? How do I import a Together library? Is there a discount for Together users? I've moved to Keep It. How can I remove Together from my Mac? Can Keep It import from Evernote? Can Keep It import from Yojimbo? Can Keep It watch a folder for imports? Can I “print” a PDF to Keep It? How can I import messages from Mail? How can I send emails to Keep It? How can I see only what is in a folder, rather than everything? How can I see the number of items in a particular list? How can I stop notes from being renamed to the first line? Can I add comments to an item? Can Keep It update Finder comments? Does Keep It search the content of files? How does text recognition work in Keep It? What formats does Keep It support? Can Keep It create files in other formats? Can Keep It create a different file format by default? What is the syntax for Markdown styles? Is data encrypted in iCloud? Are there any differences with the Mac App Store version? How can I remove Keep It from my Mac? Why does macOS say a web archive is damaged when I try to open it? How can I export all data from Keep It? How can I get a copy of all data stored in iCloud? Purchase a one-time payment for Keep It v1.x from Reinvented Software. Purchase one-time payment for Keep It v1.x from the Mac App Store. Subscribe monthly or yearly to Keep It in the Mac App Store. These options are discussed in full here: Trying and Buying Keep It for Mac. No, Keep It for Mac and Keep It for iPad and iPhone are always paid for separately. The options for buying Keep It for Mac are discussed in full here: Trying and Buying Keep It for Mac. The Mac App Store sometimes has issues restoring purchases. To get around this, move the app to the Trash and install it again from the Purchased page of the Mac App Store. Note that if you purchase Keep It from the Mac App Store, then you must use the version it installs, which you can reinstall at any time from the Purchased page. Similarly, if you purchased Keep It from Reinvented Software, then you need to download and use the version from this site. Please get in touch if you need any more help. Keep It can import libraries from Together v3.8.7 and later. Uncheck "Import into folder with same name as library" if you only intend to import one library, or want to merge your libraries. Keep It will then import the library into the top level. NOTE: It is normal for the .trlib file to be grayed out. Keep It needs to access the library folder, not the library file. See the Keep It for Together Users guide for information about some of the key differences. Please get in touch if you need any more help moving your data from Together. Yes. Together 3 users can upgrade to Keep It with a 50% discount ($24.99). If you purchased Together the final 6 months of Together being on sale (on or after February 17, 2017), you will qualify for a free upgrade. Choose Keep It > Buy Keep It from the menu, or go to the Buy Keep It page. Choose an Upgrade license and click Continue. Enter your registration code on the next page and click Continue again. You will then be shown the discounted rate or provided with a free license, if appropriate. If you have already imported a Together library, you will not need to enter your code. If you originally purchased Together 3 from the Mac App Store, you can download Keep It from the Mac App Store and get the upgrade through that. You will need to have the Mac App Store version of Together 3 installed. If you need to install it again, you can do so from the Purchased tab of the Mac App Store. Choose Keep It > Buy or Subscribe from the menu. Click "Upgrade from Together 3". Select the Together 3 application and click Choose. If you originally purchased Together 3 from the Mac App Store, but wish to use the version from Reinvented Software, you can also get the upgrade discount by importing a Together library from the Mac App Store version of Together 3, then choosing Keep It > Buy Keep It from the menu in the version of Keep It from this site. Get in touch if you need assistance. 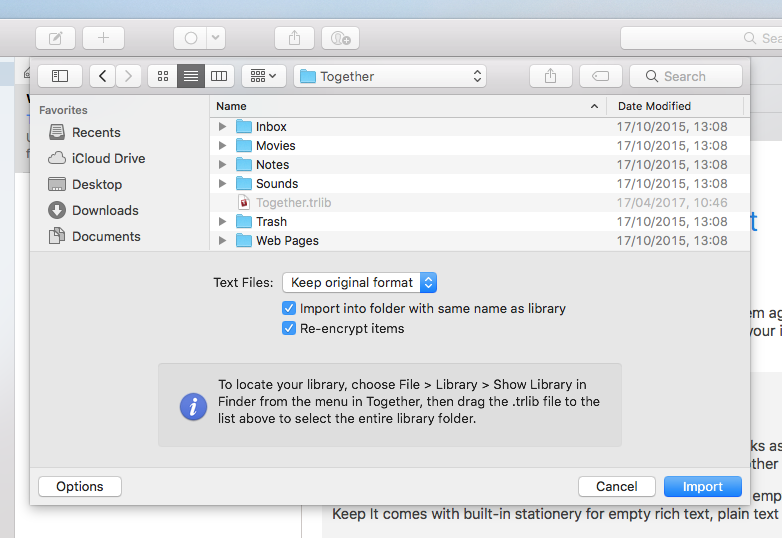 Typically this should be sufficient, but if you wish to remove every last trace of Together from your system, then the folders to remove will depend on which version of Together you are using. Select entries named "Together Mobile" or "Together 3"
Click "Delete Documents and Data"
There may be a few of these entries, depending on which version of Together you were using. Yes, to import from Evernote, first export an ENEX file for the notebooks or notes you want to import. Keep It will import notes with single attachments as standalone files, web clippings as HTML files, and everything else as a note. The HTML files Keep It creates for web clippings are not editable. You can instead choose to import web clippings as notes, but these may lose some formatting. Read the instructions for information about importing passwords and encrypted items. To skip these, click the Options button and change the settings there. If using macOS Mojave, give the app permission to control Yojimbo. You can now save files to that folder, or any of the folders inside, and Keep It will automatically add the files to its library. Once installed, you will then see "Save PDF to Keep It" by clicking the PDF button when printing. Can I import messages from Mail? Mail will allow you to drag single messages (not conversations) to Keep It's sidebar or item list. However, since macOS High Sierra, Mail has an issue where it won't add messages to bundles or labels, only folders or All Items. When the workflow is first run on macOS Mojave, you may see prompts to allow Mail to control System Events and the Finder. You should allow these things to happen or the workflow will not be able to work. From the "Show all items in folders" pop-up, choose "Never" or "When collapsed"
Change the "Automatically name notes" pop-up to either "Never" or "When first saved"
Can Can Keep It update Finder comments? If you are using macOS 10.14 Mojave or later you will need to give the app permission to control Keep It and the Finder when prompted. Once the script is installed, if you are using macOS 10.14 Mojave or later you will need to give Keep It permission to control the Finder when prompted. Keep It for Mac will search the contents of most files, provided they can also be found by Spotlight. Keep It can also perform text recognition on PDFs and images. See How does text recognition work in Keep It? for more information. Content searches match on whole words. For example, searching for "moth" or "ship" won't find "mothership", you would need to search for the whole word. To search for a partial word, place an asterisk where you want to match anything: e.g. moth* and *ship would find “mothership”. When searching for multiple words in content, the words don’t necessarily need to be next to each other, or all appear. For example “chocolate chip” would find anything that contains either “chocolate” or “chip”. To match a phrase such as “chocolate chip” exactly, place the phrase in double quotes. Keep It 1.6 and later will perform text recognition on PDF documents and images. Keep It doesn’t modify PDFs or convert images to make them searchable, but rather indexes the text so that it can be found again, and stores that text in iCloud to save repeating the work on other devices. Keep It has always been able to index the text in PDFs that have selectable text or had OCR performed on them already, and does not perform unnecessary text recognition on those, or on images that do not appear to contain any text. When upgrading to Keep It 1.6, text recognition for existing files will be performed immediately, and this may take some time. You can add any kind of file. Keep It can edit its own notes, Markdown, rich and plain text files, add highlights and notes to PDFs, and save web links either as live links or as PDFs. Keep It will use Quick Look to show previews for most other file formats. Keep It can create any kind of file using its stationery feature. Stationery can either be empty files, or templates. Stationery can also be accessed by clicking the + button in the toolbar. To add stationery or make it active / inactive, choose File > New From Stationery > Manage Stationery from the menu. You can save any existing item in Keep It as stationery (e.g. to create a template) by choosing File > Save as Stationery from the menu. Any CSS stylesheet can be used. Yes, with iCloud, all data is encrypted both while in transit, and when stored on Apple’s servers. See iCloud security overview for full details — Keep It uses the same encryption as iCloud Drive. There are no functional differences between the Mac App Store version of Keep It and the one available directly from Reinvented Software. To remove Keep It, first drag the application to the Trash. Web Archives stored in Keep It will be marked as quarantined by macOS's Gatekeeper, and when you try to open them you will see the message "[filename] is damaged and can’t be opened. You should move it to the Trash." The web archives are not actually damaged. Open the "Remove All Quarantine" application and click Run. Once the files have been processed, you will then be able to open them. When performing this export, Keep It will convert all notes to RTFD files, so that they can be read in other applications, and will offer to decrypt any encrypted files. Choose Keep It > Library > Export iCloud Data from the menu. Choose a location and click Export. When performing this export, Keep It will convert all notes to RTFD files, so that they can be read in other applications, and include a plain text file with all the metadata that cannot be included in the files themselves, along with additional information about bundles, folders, saved searches, labels, etc.